It was just another Saturday, until I heard this: “NOOOOOOOooooo!” The anguished cry went up from the farmstand, more than once. “I missed the greens?” Soulful eyes pleaded. “I can’t survive without them.” And another, maniacally gripping my lapels: “Don’t you see?! I have an addiction! !” My partner and I couldn’t escape the plaintive cries, even through our phone lines: “But…I’m a chef! What about my customers? !” As the voice trailed off into gentle sobbing, even the cashbox had a hollow, mournful clunk at the end of the farmstand, devoid of lettuce sales. It was late November, 2017. The island mood was lifting after the storm, but many of the electric lights were still dark, when I stumbled across a tragedy of growing proportions. The crisp, leafy victims? Young, too young. Baby lettuces, mysteriously disappearing or dying. Their tantalizing, sweet potential, dashed into the compost heap like another shiny American dream. Nearly broke the heart of even a seasoned professional farmer like myself. My partner and I were determined to dig to the bottom of this and find out what was happening. We hung out our agricultural investigative shingle and started burning the shoe leather. At first we had fooled ourselves, bellying up to the bar of the future for a lukewarm glass of false hope with a chaser of denial: we chalked missing lettuce seedlings up to the statistics. But as a week passed, there was a pattern: part of a tray of lettuce seedlings, just missing. Then another section, and another. Too many, just not surviving to the light of day. But those who were able to thwart this mysterious abduction were not thriving. Instead of the vibrant, green, bushy seedlings I had grown accustomed to, they were limp. Lanky. Languishing. Lifeless. My mind spun, counterclockwise, to the past. September, 2017. I thought of the powerful, angry dame with the breathy voice who had whirled through my office then. Maria, she said her name was. Could she be behind this? There was no doubt in my mind, but I still had no way to pin these crimes on her. I knew I had to find a way. I was being cold framed! I combed through the furthest reaches of my memories, scratching my beard and searching for clues. Could it be the seeds? It was now early December. We’d gone without electricity for months after Maria ravaged the island’s infrastructure, maybe the seed stock had gone bad and wasn’t germinating. I checked with my partner, but she said she’d ordered new seeds that miraculously came in the mail as soon as the airport reopened after the big storm. So we ruled that out. I knew that Maria had destroyed our seedling house. It was the place where these young lettuces would have been protected and nurtured, instead of being exposed to all the tropical dangers that can turn a fresh, innocent seedling into a twisted heap of rotting cellulose before you could say “romaine”. I had hard evidence. I had satellite photos at the scene of the violent crime. Maria had her footprints all over the mess. We knew this was big. Then, Washington put out an APB over the wire on Maria and was offering a reward for information, so we called our contacts in D.C. and filed a pile of paperwork that could’ve choked a horse. But the Feds said their hands were tied. They wouldn’t back us up. My partner cursed them with language that revealed her nautical roots. But it wouldn’t change anything. We, and all the other farmers on the island with broken and crushed buildings, were going to have to go this alone. We knew there were occasional roving gangs of mice in the neighborhood. Mostly they stayed clear of us, but with the seedling house reduced to a pile of broken lumber, their territory had likely shifted. Meanwhile, the lettuce trays had been crowded together in a smaller space to survive. The presence of this crowded, vulnerable population could have caused the gangs to become organized. We set up a sting operation involving some traps. But these were well trained soldiers and they did not fall for our subterfuge. They continued to pick off the young innocent sprouts, one by one. I laid awake at night, hearing their teeny tiny squeaky voices. Mocking me. And what about the rot? That was not gang-related collateral damage. There had to be something…something in the coir. Over eighteen years of farming, I had stubbornly resisted the use of commercial potting mix. My partner and I were both philosophically opposed to importation of resources that could be found on the island. The commercial potting products usually contained questionable characters, such as peat bog products which are not renewable. We had inherited a mountain of coconut coir nearly 20 years ago in 1999, and had been using the goldmine of fibrous hairy brown material to keep our potting mix light and fluffy. But it was heavily processed, and had to be imported. And we were running out. Maria’s punishing rains had soaked the molehill of our coir mountain that remained, and it had grown fungal and rich. Perhaps too rich for the young and delicate, innocent victims of this mysterious crime. Perhaps it was time to shut the door on the coir and find a solution that could close the book on this perfect storm of plagues. But what was the answer? I began spending sleepless nights in the crime lab, trying old and new formulations. Each one took agonizing days to test. Failure after failure threatened my resolve. There had now been nearly two weeks of greatly reduced lettuce production, a disaster that I knew would come to haunt me in early February 2018, if I couldn’t solve this problem now. Only one in five seedlings had survived the mysterious onslaught of crime. The compost was piling up. Two weeks had passed. Time was running out. Christmas was nearing, but despite the cheerful blinky battery operated lights and the holiday songs on the emergency radio, my heart was a fragile, empty shell. Bleary-eyed, I could see a dismal future ahead, full of disappointed customers, angry chefs, bills stacking up with no sales. It was a disaster borne of a disaster. But what could I do? Bob was a guy, a Guy that could Build Stuff. Sure, we’d brought him in to repair the miles of fencing that had gotten knocked down. But this was a culinary emergency, we needed all hands on deck. Bob and I threw together a tiny protected hut from the shattered remains of the seedling house. It wasn’t much, but perhaps it could save a few lives. Then another mysterious figure emerged from the mist. It was Roi. We couldn’t believe our luck. Roi knew how to build stuff. He put a sturdy roof on the hut. The shattered pieces of our lives were starting to come back together with the glue of the Guys who could Build Stuff. Back in the lab, I had become obsessed with the granularity of wood chips. We had stockpiled mountains of wood chips for mulch prior to the storm. Could an answer lie within these sleeping behemoths? I didn’t know it at the time but it was a dead end, an end that would lead nowhere and would not solve my problem. Or could it? One night, as I mopped my brow under the dimming light of the failing solar lantern, SHE walked in. She was petite, not unusual, I’d seen her type around the farm before. But what really caught my attention were those legs, those beautiful legs. She had a sinuous way of moving them that put my frontal cortex into a deep freeze. They were smooth, waxy, bright red. She had to have about 300 of them, two per segment to be exact. She crawled up my arm and looked me straight in the eyes, meaningfully waving her feelers at me. I could almost hear her teeny tiny voice say, “Use the force, Lucaaaaaaaaa.” I knew it was the hand of fate, Lady Luck dealing me a winning hand. And I knew what I had to try. The wood chips to replace the coir had to be gongolo and millipede composted. I tried to hold myself back from counting unhatched chickens, but I could feel it in my bones. I knew I had finally stopped this crime wave and restored a new normal to these young summer crisps, with the help of my leggy friend, the Guys Who Could Build Stuff, and my faithful and salty partner. After a few days, I reaped the success of my experiment. The sweet sweet smell of our new formula of potting soil soothed my soul. The emergency lettuce hut kept the mice at bay. And the seedlings begin to show a vitality and vibrancy that made my heart sing. The lettuce was growing leafy and full again. I knew the customers would never understand. It was too complex, too nuanced, too frightening, too much to wrap your head around. Plus, insects. The whole thing was like a dream. A nightmare, really, one that I’d feared I’d never awaken from. But now, the birds were singing. The lettuces were growing again. The mice had moved on. I knew that there would be lean times ahead. There would be at least a week, maybe two, in mid February, when the people would cry out in sheer agony, for lettuce, for lettuce products, blissfully unaware of the struggles and darkness we had been through in the dark, dark days of December. But that didn’t matter now. Because we had so many cherry tomatoes. Post-hurricane adjustments took time, during which we were also trying to train a new employee, repair broken infrastructure on the farm and in our home, apply for federal disaster programs and make business decisions based on unknown disaster zone variables, including the size of our customer base post-storm: many of our permanent resident customers had taken mercy flights to the states for an unpredictable period of time, and we had no way of knowing whether our seasonal resident customers would be back for the season. The customer response this season has been unpredictably huge, and we are fielding a few complaints that there is not enough produce to go around (despite the fact that we are always packing away some food items at the end of every farmstand). Please know that if we could grow more food for you, we would. Farming is seasonal and subject to the vagaries of nature. And other farms on St. Croix will soon be producing more food, stay tuned! Costume your table in a tiny Caribbean festival of flavor and let the juicy sweetness march into your mouth! ARTfarm is open today 10am-12 noon with beautiful sweet salad mix, spicy salad mix, lettuce heads, escarole, lots of kale, collard greens, broccoli greens, mustard greens, dandelion greens, beets, onions, limes, passionfruit, cucumbers, radishes, sweet peppers, tomatoes, cherry tomatoes, cilantro, garlic chives, dill, parsley, rosemary, sage, Italian basil, Thai basil, lemon basil, lemon balm, fresh Mediterranean figs, honey, and vegan coconut-based ice cream. All a di gal dem. Whine up, whine up! ARTfarm Happy Monday – Ice Cream is Back! 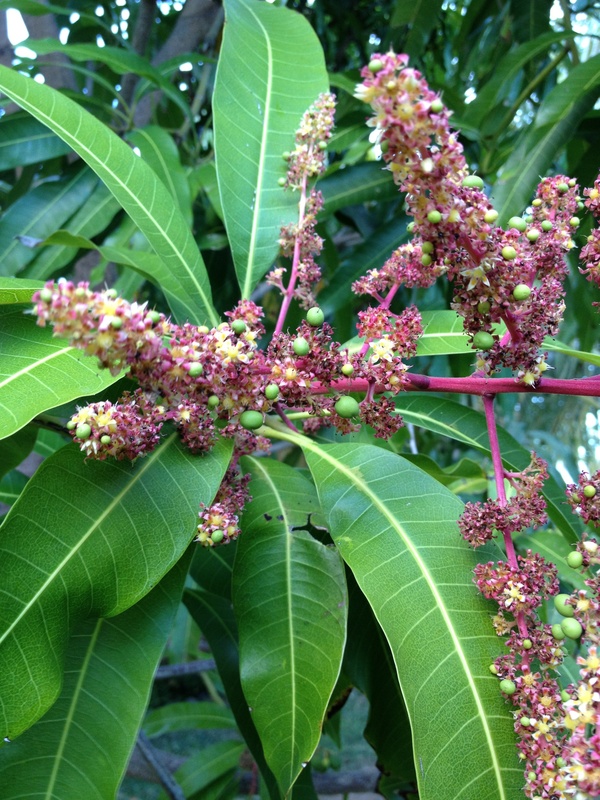 Tiny green orbs pop out of pink spires of mango tree blooms, at ARTfarm on St. Croix's South Shore. In a few months they will grow to become large, sweet, heavy mango fruits. Have you noticed it getting drier, windier and hotter this month? Normally things would dry up in January or earlier, but we’ve been blessed with an extended rainy season this year. On the south shore of St. Croix, the air smells different. Pastures are starting to dry up quickly and the hills are changing from a vibrant green to some more muted shades that are shifting into gold and brown. We are watering our crops more often. As the tomatoes get more flavorful on the vine, the mango flowers are starting to set fruit for June. All this dry heat means that it is time to treat ourselves to a delicious cold frosty Feel I ice cream!! YES! It’s back!! Today we have Feel I’s mango, guava, passionfruit, and banana flavors, all made from local fruit and local coconut cream – no dairy. Get one of each! We’ve got Sweetface chocolates, too, if you need darker decadance. If you’re feeling more savory, we’ve got baby spicy salad mix, sweet mix, cherry and big tomatoes, cucumbers, pumpkin, scallions, garlic chives, sage, green coriander, Italian basil, sweet and hot peppers. For a pop of color, go for a bunch of fresh cut zinnias, a sunflower or two, and a papaya! See you this afternoon, 3-5:30pm. Tomatoes…and introducing our new pasture management team. ARTfarm welcomes the newest members of our Pasture Management Team: Sleepy, Coco, Yooyoo, Nobby, and Whoopsie. 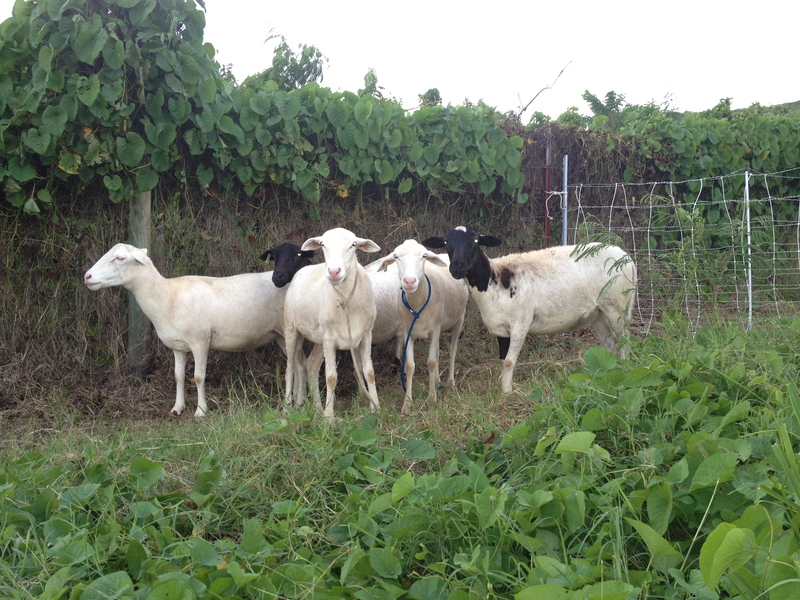 These local hair sheep are Dorper, St. Croix White and Brazilian Nova mixes. We are now at the point in the season where we put up the giant “TOMATOES” sign, and you’ll start to see our cherry tomatoes in local fine dining establishments! Saturday morning’s stand will also include fresh microgreens, sweet mix, spicy mix, teen spicy, a plethora of varied cooking greens, herbs including some new ones for this season (sage! holy basil!) and your old favorites (delfino cilantro, italian, lemon and thai basils, thyme, caribbean oregano, lemongrass, garlic chives, and giant scallions! )…cucumbers, lettuce heads, and of course giant zinnia flowers, chocolates and a few baked treats! Please call or let us know at the stand, if you’d like to special order fresh local meats: chicken (half or whole), lamb or goat (leg, roast, cut for stew). ARTfarm gift certificates are beautiful and make a thoughtful gift. And in other exciting farm news, our Livestock Manager has acquired five experienced new employees (pictured above) who are charged with improving our pastures and keeping things nicely trimmed around the farm. Please join us in welcoming Coco, Sleepy, Yooyoo, Whoopsie and Nobby. They’re all expecting! Christina plans to bring them out to visit at the farmstand after they’ve had a chance to get accustomed to their new home and the staff. Saturday morning’s farmstand will include microgreens, pineapples, yummy garlic chives, cooling thai basil and lemongrass. We’ll have local honey, honey vinegar, luscious buttery mangoes, chocolates from Sweetface and Feel I’s coconut-based local fruit ice creams, including our family’s favorite flavor, hot pink Beet Ginger. 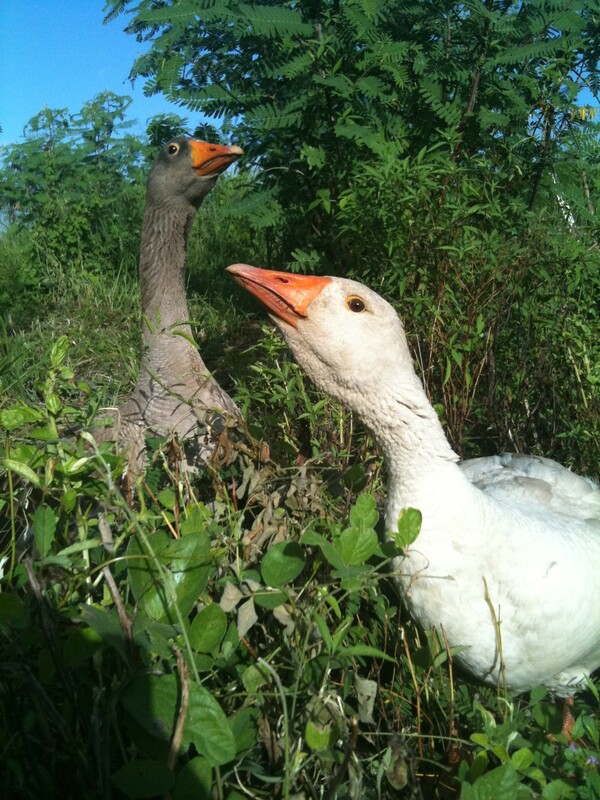 A Buff and a Toulouse goose wander in one of ARTfarm's fallow summer gardens, munching on basil and hot peppers. The recent rains have sent the farm into summer hibernation a few weeks early, and Farmer Luca and new employee Tucker are busy pulling out old plants and mulching down the gardens for a well deserved rest between growing seasons. The geese have been given free rein in the back garden and are happily eating weeds, grass, basil and pounds and pounds of hot peppers.